Although it doesn't stand the test of time as well as some other Roguelike classics (most similarly Sword of Fargoal), Beneath Apple Manor is still as much fun today as it was in 1983 - and definitely more fun than Avalon Hill's slightly older and better known Telengard. As an intrepid hero, you goal is to descend as deep as you can into the dungeon to retrieve the genuine golden apple (there is a fake one in the game that will instantly kill you). You have four stats: strength, intelligence, hit points, and gold. There are 3 types of armor and several weapons you can wield. You could also use the "Zap" spell, as well as magic items. You will battle ghosts, trolls, slimes, dragons, and a few more monsters. Although Beneath Apple Manor is simpler than Rogue, it is still a very fun game that remains playable to this day. 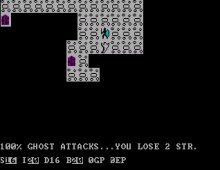 Considering that it ran in 16K and was written in BASIC, the game's ability to generate random dungeons and dynamic difficulty level is nothing short of a programming marvel. If you like Roguelikes, check out one of the oldest - and rarest - pioneers in the genre. Thanks again to Don Worth for letting us distribute this underdog :-) And if you really want a blast to the past, download the original Apple II version of the game from the "Extras" section below.